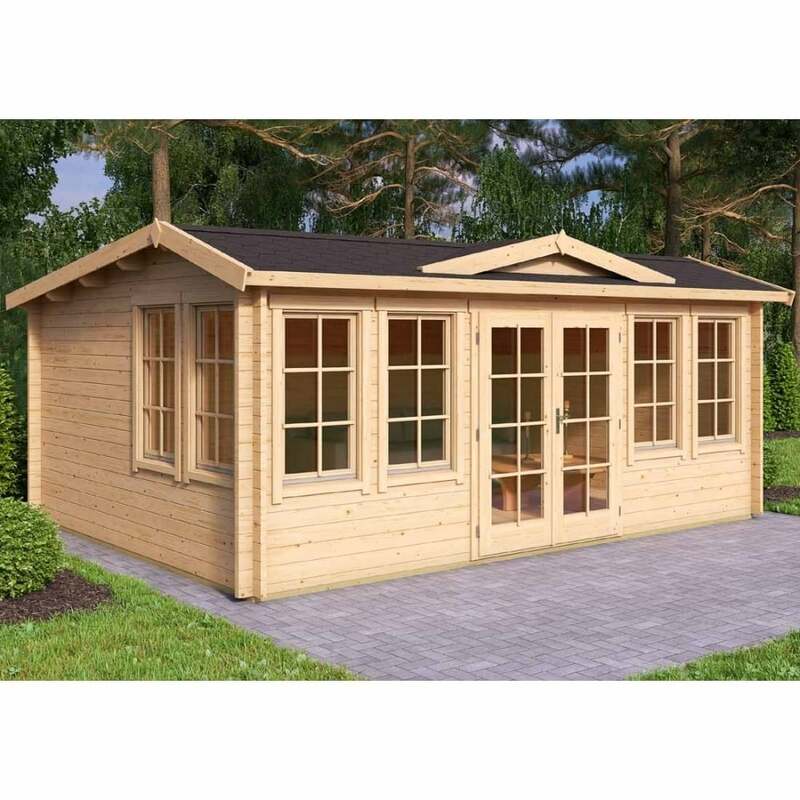 Norland Harrogate Log Cabin: The Norland Harrogate log cabin is a large 5.3m x 3.8m log cabin that will be suitable for a variety of different uses. The building has an attractive clock-house roof design with a double door to the front which is fully glazed, there are 6 single windows on this building, 4 of which sit on the front to the sides of the central door and two further windows sit together on one side of the building, the wall logs are reversible so that you can choose which side you would like the windows but they have to stay together. The windows on this building are inward opening to allow in plenty of air and light. This building would be the perfect retreat in the garden for guests to stay over or as a place for teenage children to call their own away from the main house. This building although generous in size still maintains a ridge height which is less than 2.5m in height so is ideal for the garden. This building has double glazed windows and doors and the wall logs are 44mm thick making this building suitable for all year round use with only a minimal heat source. There is the option to purchase roof insulation if you want to further enhance this building for use throughout the whole year. This building will be delivered in kit form and has interlocking corner joints for a classic appearance and straightforward build.